After years of waiting, fantasizing about what the future may hold for us, it was finally time for those dreams to be made real. The key life has given us would now open the doors to the rest of our lives. What we've looked forward to for years was finally happening before us. I couldn't have been more worried. All of our young lives, we anxiously awaited this day. We talked about it, dreamt about it, and even wrote a cheesy play about it. Imagining what it would be like after being initiated; it used to be a fascinating game to us back then. But we were completely oblivious to the reality of it all. By the time this ends, we'll have earned our wings and magic, based on what faerie type fit our personalities best. Nothing will be the same after this. I tried to swallow my fear as we approached the Faerie Queen. My best friend walked vigorously beside me, clanking her heels into the ground so furiously that imprints were left behind. In her clenched fists rested the answer sheets of our quizzes. At the bottom of each crumbling paper were our results: a picture of which type of faerie we were most like, previewing what we were soon to become. Carefully I studied my friend's angered face. Tears of hatred threatened to well up in her eyes, and yet she found the strength to hold them back. Illusen never shows signs of weakness, and this was no exception. "I know you didn't want to be an Earth Faerie," I told her, my voice filled with concern (which is weird...!). "But there's no changing it now." I hoped and pleaded that was all I needed to say. That Illusen's light gray eyes would illuminate with gratitude, and she'd smile and hug me and stop moping around about it already. But Illusen crushed THAT dream in a heartbeat. "That's easy for you to say, Jhudora!" she snapped coldly, her snowy white hair brushing across her vision as she glared. "YOUR quiz results said that you'd be..."
I must be psychic, 'cause guess what? She began to gripe on about it... AGAIN. "Yeah, but with you, it's different!" Illusen whined for the 1,742,945th time. "You WANTED to be a Fire Faerie in the first place! I DIDN'T want to be some Tree-Hugging, Plant-Loving, Earth Faerie with dumb, powerless Magic! I wanted to be a Light Faerie... you know, the kind that can do more than just grow a bunch of weeds?!" Honestly, I was ready to strangle her at this point, but I decided to play along. "You love flowers and gardening!" I pointed out. "And besides, Earth Faeries can do more than just grow them. They can control them, like a Fire Faerie can control flames. You should be happy about this!" Illusen crossed her arms at her chest, her eyes now gazing toward the ground instead of at me. "Yeah, happy like a Grey Faellie." I groaned. Well, at least she couldn't complain about it for much longer. We now stood before Fyora, staring out into the thousands of joyous faeries observing the ceremony. No, that wasn't even CLOSE to how many faeries were out there. There were tens, of hundreds, of MILLIONS of them, by the looks of it! Illusen's grimacing jaw dropped to an astounded gape at the sight. I would've laugh about it, too, if I wasn't doing the exact same thing. "Citizens of Faerieland!" she announced loudly, her voice echoing throughout the Palace Grounds for all to hear. The Queen winked at the two of us happily. Looks like I'm the one grimacing now. "We are gathered here today, to initiate two of our own. These teenage Faeries - " Fyora gestured to Illusen and me. " - will soon be full-fledged members of our society!" The audience clapped approvingly in reply. I still didn't look at them, however. I didn't have to; Fyora's hand gently spun me around to face her right then. "May I have your quiz results, sweetie?" she asked all softly and tenderly, which only caused me to gag. Who does she think she is, talking to me like this? She's only 175 years older than us (which isn't very long in Faerie Years), and yet here she is, talking to me like I was a baby. I managed to growl silently under my breath before Fyora turned her head toward Illusen. My friend was scribbling something down on my paper with a pencil. Before I could ask what she was doing, she answered, "You forgot to write your name at the top." As she handed Fyora the paper, something strange caught my eye. The picture of the fire faerie on my quiz -- my result -- looked as if it were turning... purple? Nah, of course it wasn't. 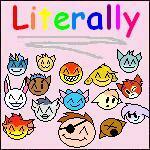 When Fyora grabbed the papers and glanced at them, the smile on her face faded instantly. She shook her head sorrowfully. "I am truly disappointed, Jhudora." Fyora shrugged her shoulders in dismay. "I really thought you were better than that!" "Jhudora will be our first participant!" I opened my mouth to protest, but I knew there was no use to argue. Talking the Faerie Queen out of something is like giving an Altachuck to a Draik named Diana: it just doesn't work. So I stood there, watching nervously as Fyora closed her eyes and mumbled strange words under her breath. Slowly, my paper began to glow in her hands, becoming a brighter and brighter shade of pink as she spoke. When she finally opened her eyes, the paper was glowing as bright as the sun. My eyes forced themselves closed. "Jhudora's quiz results have now been charmed," Fyora explained to the crowd. "When I return this paper to her, she’ll officially be one of our own." I couldn't see where Fyora was standing, but I knew she was close. The blinding light shone through my closed eyelids. I closed them tighter. A warm hand suddenly grasped mine (Fyora's, no doubt), and placed something into the palm of my hand. I opened my eyes to see what it was, but the light was still too bright for me to bear, so I squeezed them shut again. A light breeze began to circle around me. Illusen's voice, Fyora's voice, everyone's gasps and shouts were crystal clear when I heard them. "The light... is it supposed to be surrounding her?" ...Okay, who on Neopia said that last one?? Finally, I couldn't take it, anymore. I opened my eyes. Wait, did I? It was so dark, I might as well have kept them closed. All I could see was a faint outline of my quiz result paper, and my own hand clutching it. But, as soon as it began, it ended. I must've blinked, because when I opened my eyes again, the darkness had faded away. Illusen and Fyora stood beside me: Fyora's eyes blown wide open in horror, and Illusen's mouth curled upward into a smug, little grin. I wasn't looking at them, however. Instead, my eyes were locked on my paper in horror. I answered the 3rd choice for #1, not the 5th one! 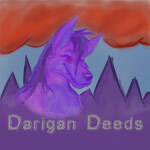 And the 7th question, I didn't answer Darigan Citadel! And the picture, why was it of a DARK Faerie??? I looked down at my hands. They were no longer of regular skin tone, but were a light shade of purple. One of them pulled a strand of hair to my vision. It was now a deep violet, with streaks of green here and there. "Who did this?" I shouted. Even my voice had changed - it sounded deeper, more threatening than before. "Who did this?? Who changed my quiz answers???" No one answered, but it didn't matter, anyway. Right then, it hit me. I knew just who had done this. "Illusen!" I cried, anger empowering my voice even more as I spoke. "What is your motive for doing this??" I knew it was her. When she was writing on my answer sheet, she wasn't writing my name on it. She was changing my answers, so I'd have a Dark Faerie result instead of a Fire Faerie one. She had to fess up. She NEEDED to! But she didn't. Illusen simply twirled her hair and pouted: her classic 'I'm not guilty' look. "I didn't do anything," she said sweetly, but I knew it was fake. "Yes, you did!" I retorted. "I saw you! You changed my answers right before you gave them to Fyora!" She shrugged her shoulders, still twirling her hair innocently. "All I did was write your name at the top." "LIAR!!!" I screamed, my hands bawled into tight fists. "You're nothing but a LIAR!!!" I wanted to attack her, right then and there, but Fyora grabbed my arms and restrained me from her before I could. "You can't let her get away with this!!!" I shouted over and over again, as Fyora apologized to the crowd for my behavior. "She's lying! SHE'S GUILTY!!!" But no one ever listens to Dark Faeries. Especially ones that they think are deranged. Fyora summoned two of her guards to send me away. The next thing I knew, I was in handcuffs, being held down by two Fire Faeries. "I'm sorry about Jhudora, Illusen," Fyora told my betrayer, who nodded as if she deserved it. "We'll just initiate you tomorrow, once this is all settled." Illusen smiled, her grin obviously fake. "I appreciate that, your Majesty." Then and there, I vowed I would have my revenge. Fyora wasn't even deserving of the throne, and this was clearly proof. One day, I will seize power, myself, and run things as they should be. And the first thing I'll do as queen, my greatest of all orders, is to send Illusen into prison for all eternity. "I'll never forgive you for this, Illusen," I muttered to myself, as she walked away with her triumph. "Never!" There. As you finish reading this story, I assure you that soon all will know the truth about Illusen. Our rivalry began all because of her. She isn't as good as she appears to be. You believe me, right? No one ever has believed that I was innocent, but you do, right? Will Hanso finally be able to pull off his prank?